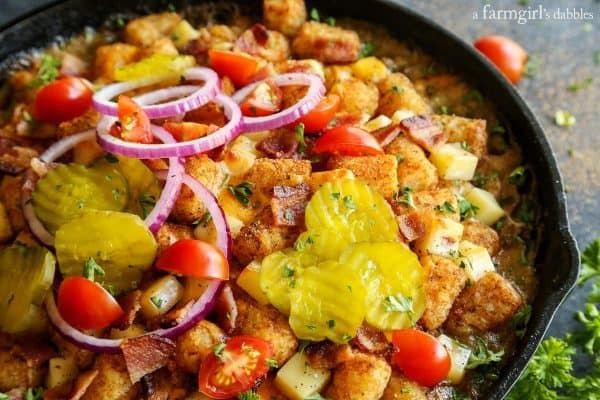 This Bacon Cheeseburger Tater Tot Hotdish slides in with a fun twist on an old favorite! Stepping outside in the early morning to just a bit of a chill in the air. The quicker cool-down in the evenings, with the sun settling down over the horizon before we’re ready to call it a day. 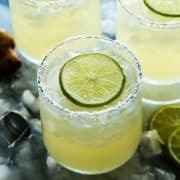 It’s still summer, according to our calendar and its more relaxed schedule. But fall is closing in. The cooler weather, especially when accompanied by a few days of overcast skies and rain like we recently experienced here in Minnesota, always has me craving something cozy at the table. 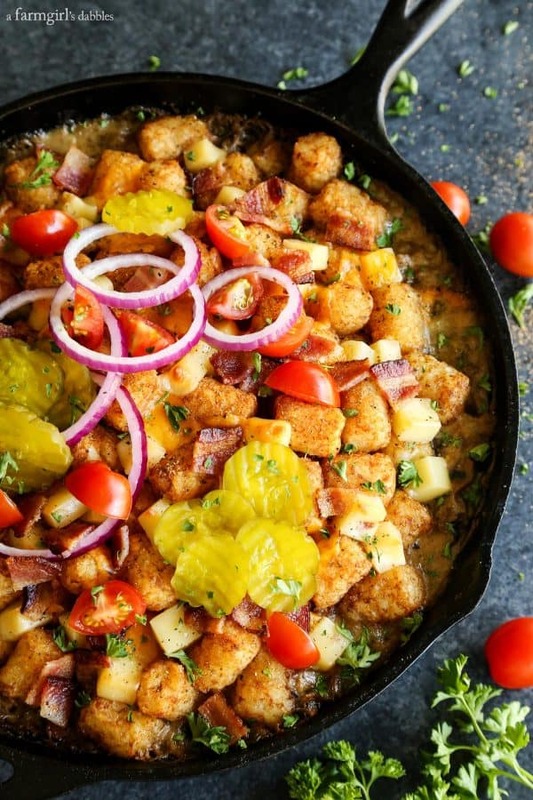 This Bacon Cheeseburger Tater Tot Hotdish slides in with a fun twist on an old favorite. Comfort food at its best! 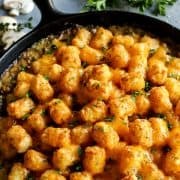 My family loves a cheesy tater tot hotdish. 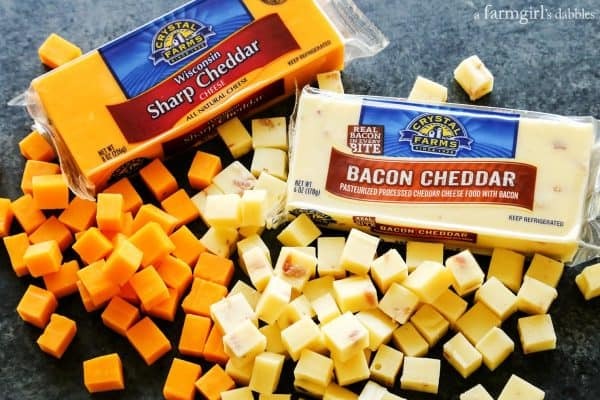 I sway back and forth between using shredded cheese, where the cheesiness is more blended throughout the dish, and block cheese cut into cubes, which gives the experience of biting into pockets of melty cheese. Both are good; you can’t go wrong either way. 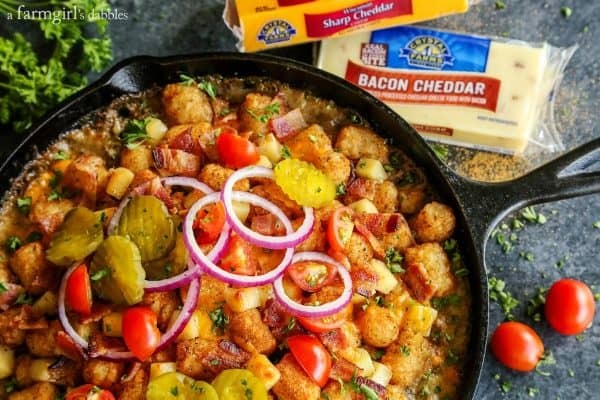 In this bacon cheeseburger tater tot hotdish, I was bent on using a bacon cheddar block from Crystal Farms. My family loves it. Plus a block of their sharp cheddar. I always, always, always include sharp cheddar in our tater tot hotdish meals! 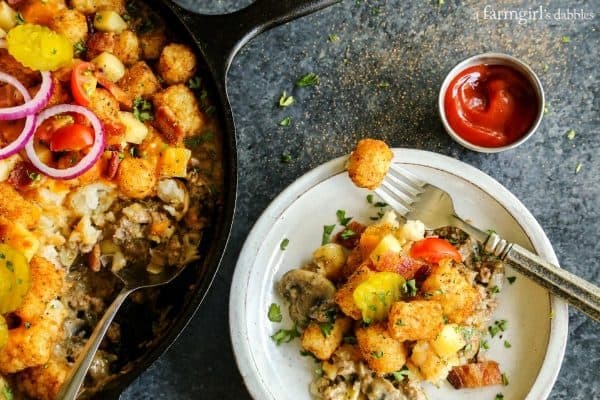 I fancied-up this easy-to-make hotdish with a creamy, flavorful homemade gravy, plus some fun “bacon cheeseburger” flair on top right before serving. 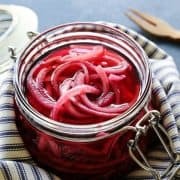 But to shave some time off preparation, I’ve included instructions in the recipe for simplifying the prep by using canned cream of mushroom soup and omitting the garnishments. The dish still comes through as BACON CHEESEBURGER in flavor, I promise. My family was excited, yet cautiously skeptical, when I said I was going to add chopped hamburger dill slices to the gravy. Hatti even wrinkled up her nose, saying I was going to ruin one of her favorite meals. But it turns out, the pickles were the clincher in bringing through that bacon cheeseburger awesomeness. 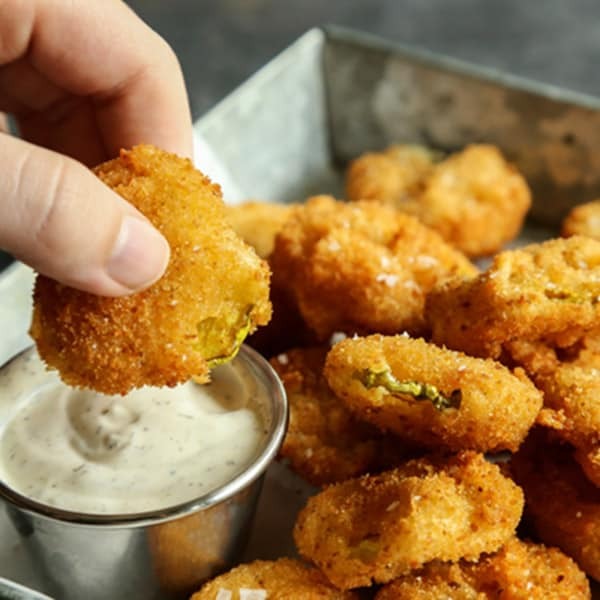 The pickle flavor is not overdone. It’s subtle. Hatti even goes back for seconds. 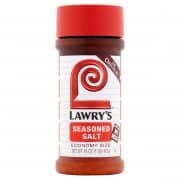 The other flavoring I use to bring the bacon cheeseburger flavor through is Lawry’s seasoning salt. This is the seasoning I grew up on when it came to hamburgers and skillet potato dishes. It just seemed natural to me to use it as the salt seasoning in this new recipe. I like to think of it as an ode to Mom’s cooking. I have always enjoyed my helpings of tater tot hotdish with a side of ketchup. And with this latest rendition of this staple Minnesota dish, it feels all the more appropriate. Necessary, even. Because BACON CHEESEBURGER and TATER TOTS! 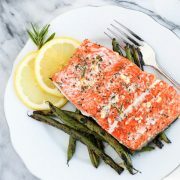 NOTE: To make this meal in quicker fashion, use (2) 10-ounce cans of low-sodium cream of mushroom soup instead of making the homemade gravy (and omit 4 tablespoons of the butter, plus the flour, whole milk, and sour cream). I have included directions for this time-saving option below. 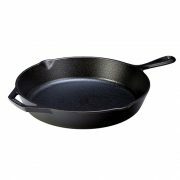 Heat a large cast iron skillet (mine is 12 inches in diameter, with tall sides) over medium to medium-high heat. Add beef and brown it, stirring occasionally. 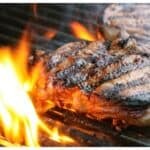 Remove browned beef to a plate with a slotted spoon. Discard all but 2 tablespoons of any accumulated beef fat, and then add 2 tablespoons of butter to the beef fat in the pan. Once butter is melted, add onion, mushrooms, and garlic. 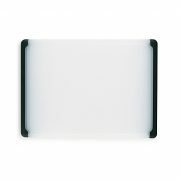 Stir to incorporate. Cook until the onions are transparent and the mushrooms are nicely softened, about 10 minutes. * If using canned cream of mushroom soup instead of making the homemade gravy, skip the next paragraph. TO MAKE THE HOMEMADE GRAVY (skip this paragraph if using canned cream of mushroom soup): Now slide everything in the skillet to one side. Tilt the skillet to draw the juices from the vegetables out into the empty side of the skillet. Add remaining 4 tablespoons of butter to empty side of skillet. 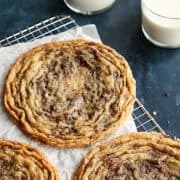 When the butter is melted, sprinkle the flour over the butter, whisking all the while (a flat whisk works awesome here!). Draw in as much butter, beef fat, and juices from the onion and mushroom mixture as you can, into the flour. 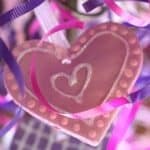 The mixture will be thick and paste-like. Cook for a minute or two, until the mixture is browned and fragrant. Then add Worcestershire sauce to the gravy side of the skillet. 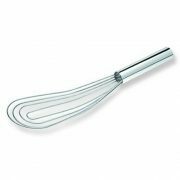 Whisk and cook for 1 minute. Then slowly add the milk while you whisk and scrape the bottom of the skillet. Once this mixture is smoothed out, bring the onion and mushroom mixture into the milk mixture, and then add the reserved beef. Add diced pickles, Lawry’s seasoning salt, and black pepper, and stir to incorporate. Cook until thickened, about 5 minutes. Then stir in sour cream, plus 2 tablespoons of the chopped parsley. Add half of each of the cheeses, and stir to incorporate. Taste the gravy, adjusting with additional Lawry’s seasoning salt and black pepper if needed. Level mixture out in the skillet. Then top with frozen tater tots. Sprinkle with a bit more Lawry’s seasoning salt. TO USE CANNED CREAM OF MUSHROOM SOUP (skip this paragraph if making the homemade gravy): Add two 10-ounce cans low-sodium cream of mushroom soup to the onion and mushroom mixture in the skillet. Add reserved beef and chopped pickles, and stir to combine. Stir in Worcestershire sauce. Then add half of each of the cheeses, and stir to incorporate. Let mixture warm for a couple minutes. Add Lawry’s seasoning salt to taste, plus black pepper. Level mixture out in the skillet. Then top with frozen tater tots. Sprinkle with a bit more Lawry’s seasoning salt. 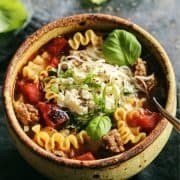 Place skillet in the preheated oven and bake for 35 minutes, then remove from oven and sprinkle with remaining cheese cubes and plenty of freshly ground black pepper. Place skillet back into the oven and bake for an additional 10 minutes. Place skillet underneath the broiler for a few minutes, until the hotdish is bubbling and the tater tots and cheese are browned to your liking. Remove from oven and serve hot. 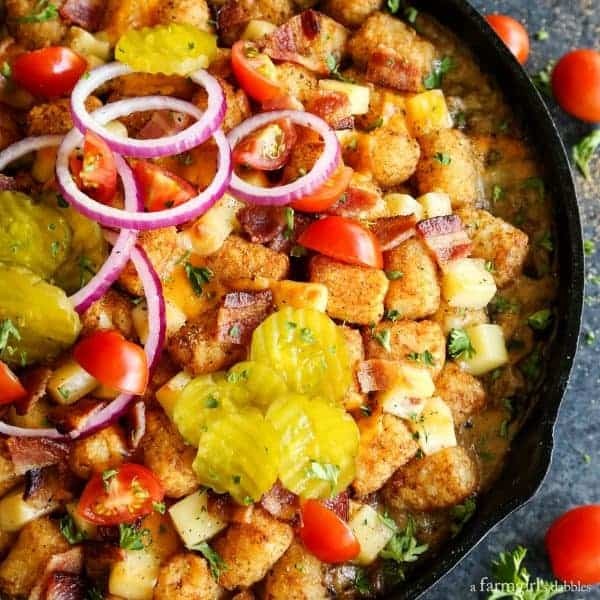 OPTIONAL: To add even more “bacon cheeseburger” flair, garnish hotdish with chopped bacon, red onion slices, hamburger dill slices, fresh cherry tomato halves, and chopped parsley. Also set out ketchup and mustard. I like to eat my hotdish with ketchup for dipping. Because. Cheeseburger and tater tots! 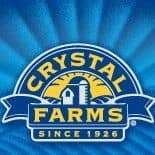 One of the largest cheese brands in the country, Crystal Farms has been committed to providing the highest quality, best tasting cheese products since 1926. Find their calcium-rich goodness in the refrigerated dairy section of your grocery story, straight from their home in Lake Mills, Wisconsin. 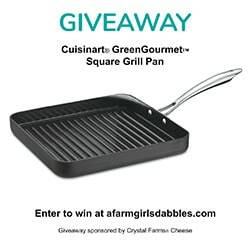 And be sure to enter this giveaway sponsored by Crystal Farms – you could win this Cuisinart® GreenGourmet™ Square Grill Pan! Go here to enter!